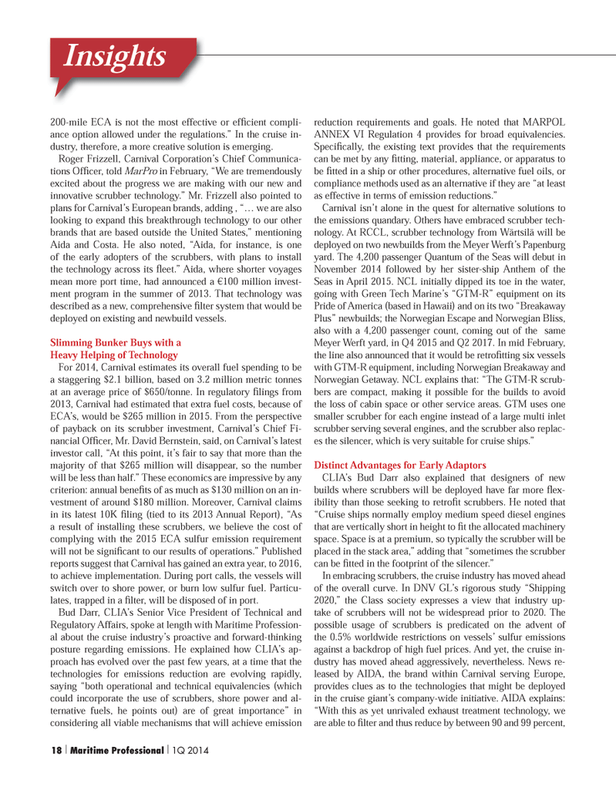 Insights 200-mile ECA is not the most effective or effi cient compli- ance option allowed under the regulations.” In the cruise in- dustry, therefore, a more creative solution is emerging. Aida and Costa. He also noted, “Aida, for instance, is one of the early adopters of the scrubbers, with plans to install the technology across its fl eet.” Aida, where shorter voyages mean more port time, had announced a €100 million invest- ment program in the summer of 2013. That technology was described as a new, comprehensive fi lter system that would be deployed on existing and newbuild vessels. ECA’s, would be $265 million in 2015. From the perspective of payback on its scrubber investment, Carnival’s Chief Fi- nancial Offi cer, Mr. David Bernstein, said, on Carnival’s latest investor call, “At this point, it’s fair to say that more than the majority of that $265 million will disappear, so the number will be less than half.” These economics are impressive by any criterion: annual benefi ts of as much as $130 million on an in- vestment of around $180 million. Moreover, Carnival claims in its latest 10K fi ling (tied to its 2013 Annual Report), “As a result of installing these scrubbers, we believe the cost of complying with the 2015 ECA sulfur emission requirement will not be signifi cant to our results of operations.” Published reports suggest that Carnival has gained an extra year, to 2016, to achieve implementation. During port calls, the vessels will switch over to shore power, or burn low sulfur fuel. Particu- lates, trapped in a fi lter, will be disposed of in port. ANNEX VI Regulation 4 provides for broad equivalencies.